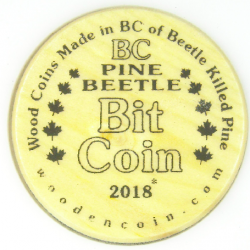 woodencoin.com mints the finest plank-cut wood coins from BC Beetle Kill Pine. These coins feel as slick as they look due to a coat of Child-Safe Lacquer which seals the image within for eternity. 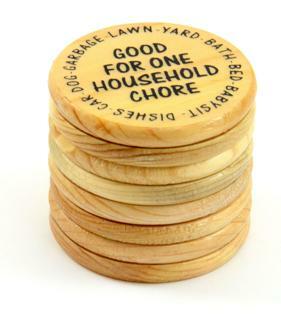 These 45 mm diameter (1¾ inch) x 4.75 mm thick (1/5 inch) wood coins are printed with single colour black so as to display the unique information, message and logo you wish to capture and echo through time. Often tossed but rarely lost. Your Brand, Message or Contact Information can be truly “Coined into History”. Hover over our coin to take it for a spin! Touch our coin to take it for a spin!